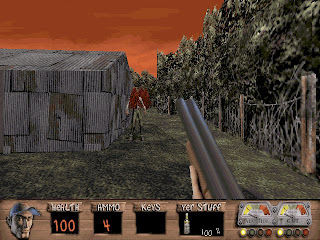 Redneck Rampage is a first-person shooter game designed by Xatrix Entertainment and published by Interplay in 1997. 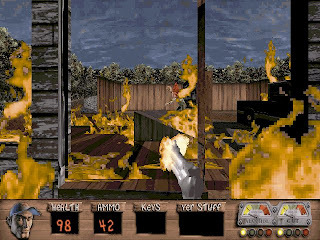 This game features some songs by Mojo Nixon, Reverend Horton Heat, Beat Farmers and other Psychobilly artists. 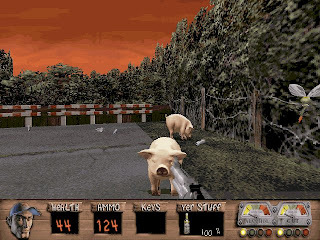 The plot revolves around two brothers, Leonard and Bubba, fighting through the fictional town of Hickston, to rescue their prized pig Bessie and thwart an alien invasion. The brothers battle through such locales as a meat packing plant and a trailer park, and battle evil clones of their neighbors with weapons ranging from the traditional shotgun, to a gun that fires circular sawblades, to a crossbow that fires bolts with dynamite strapped to them. Other than Leonard & Bubba, there are several types of alien enemies wielding various types of weapons. The enemies are sheriff, skinny old coot and the alien saucers. Boss enemies include Assface, the alien vixen, and the alien hulk. One of the funny part of the game is that almost all animals are hostile. The animals that appear include pigs, dogs, mosquitos, cows and chickens, although the latter two can't directly harm us. Like most first-person-shooters, there are a variety of ways for us to regenerate health. These power-ups consisted of the allegedly redneck related moon pies, pork rinds, beer and liquor. A small supply of each could be carried for future use. Each of these power-ups had distinct disadvantages: The more food the character ate, the more flatulent he became, making it difficult to sneak up on enemies as the character would move forward and make a distinct fart sound frequently after eating. When drinking alcohol, the health was restored and as an added benefit the character became somewhat less affected by enemy fire. This only worked to a minor degree, and the more the character drank, the less coordinated they became. This was measured on a 'drunk meter' in the user display. 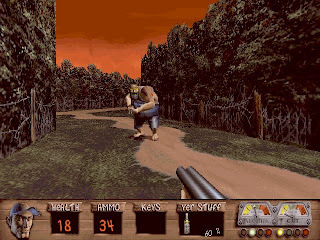 Toward the high end of the meter, after consuming a large amount of alcohol, the character movements would become erratic and the user would have difficulty controlling the character as he moved in directions that did not correspond to the input on the keyboard. 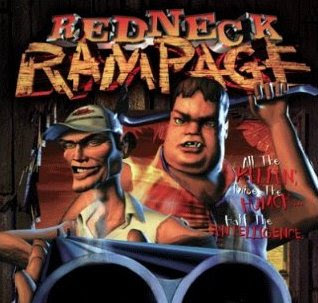 In conclusion, Redneck Rampage is a good first person shooter that will provide us with hours of fun time. 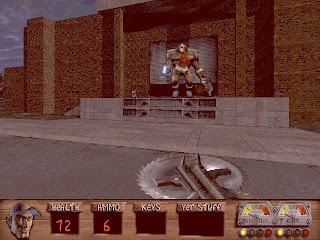 If you like Duke Nukem 3D, you shouldn't miss this one.